I saw these stamps at Avery Elle and of course I just had to have them. I mean really...look at the adorable dog. Now look to the right at my profile picture...no, not at me, at my fur baby. They could be twins! So I am playing today at Avery Elle in their Stripes Challenge. The pattern paper of course has stripes, then I heat embossed a few stripes on the "3" balloon. Even the twine has stripes. I stamped a second fur baby head so the twine would go behind him. The balloons have been coated with irRESISTible Pico Shimmer (just sayin' here....this is the greatest shimmer dimensional ever). 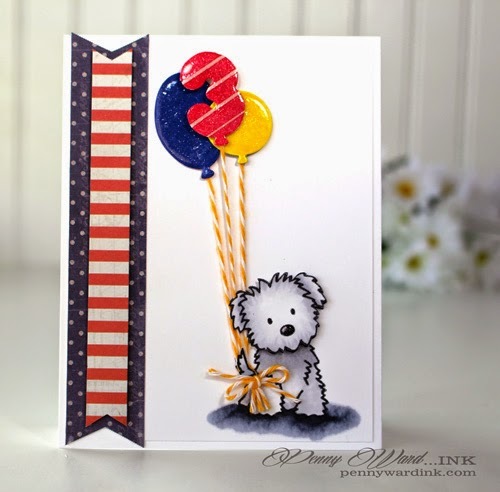 Beautiful card, love the stamp it is so cute and the balloons are gorgeous. It definitely looks like a Bichon. Oh my word! Total CUTENESS!!! 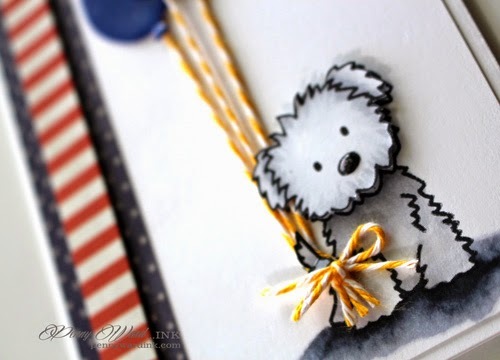 What a fun card - love your colors and coloring, not to mention the fussy cutting! Thanks so very much for playing along with AEIheartU this month! Gasp - this card is SO CUTE!!! Love it, it made me smile so big when I saw how cleverly done it was!! The balloons are perfect and this card would be awesome for my granddaughter who is turning three in a few days! just amazing and it gave me an idea for her - so thank you very much! !